Chinese stocks fell more than two percent on Monday after regulators announced on the weekend the ninth increase in bank reserve requirement so far this year. Starting from November 26, the lenders will have to put 13.5 percent of their deposits at the People's Bank of China (PBOC) as reserves, the highest level ever, the PBOC said on Saturday. That latest monetary policy promoted panic selling in the stock market, which has been on a downward trend in the past few sessions. By close, the benchmark Shanghai Composite Index lost 127.81 points, or 2.40 percent to 5,187.73 points, after hitting as low as 5,032.58 during the session. The closing level marked a decrease of 15.29 percent from the all-time high of 6,124.04 set on October 16. Other key indicators also fell. The Shenzhen Composite Index declined 1.54 percent to 1,280.72 points, while the CSI 300 Index covering major companies on the two bourses decreased 1.24 percent to 4,978.25. The tumble was a sharp contrast to the market's performances after earlier bank reserve hikes, which were mostly followed by increases in the stock indices. Accumulative effects of the policies are kicking in, analysts said. The market may continue the downward trend as the consumer price index (CPI), a barometer of inflation, and other key figures will be released this week, which may further spark fears for another round of tightening measures. The CPI, scheduled to be released on Tuesday, is widely expected to increase from the 6.2 percent in September, and the rapid investment growth will continue. Another indicator of inflation, the Producer Price Index (PPI) increased 3.2 percent in October from the same period last year, the fastest growth in nine months, the National Bureau of Statistics said Monday. That indicated a spillover of price pressure from the food sector to other areas of the economy, according to analysts. In the first nine months, the world's fourth largest economy grew 11.5 percent from a year-earlier and the CPI rose 4.1 percent year-on-year, far above the official target of three percent. To prevent the economy from overheating and curb inflation, analysts expect the central bank to raise the interest rate for a sixth time this year. The bank reserve ratio could also be raised further, as the country's surging trade surplus is pumping cash into the financial system. China's trade surplus in October jumped to an all-time high of US$27.05 billion, the General Administration of Customs said on Monday, bringing the total in the first ten months to $212.37 billion. The previous monthly record of US$26.9 billion was set in June. To mop up the liquidity, the bank reserve ratio might reach 15 percent in 2008, the Industrial and Commercial Bank of China (ICBC) said in a recent report. The central bank could also continue to issue central bank bills, analysts said. All these tightening are unfavorable to the stock market as they will reduce the money available for equity investment. 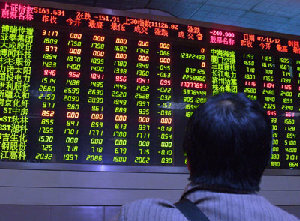 The weak global markets also dragged down the Shanghai and Shenzhen markets. Last week, the Dow Jones industrial average dropped 4.06 percent and the S&P 500 tumbled 3.71 percent, while Nasdaq plunged 6.49 percent. On Monday, Japan's Nikkei average hit its lowest level this year, while the Hang Seng Index fell 3.15 percent.